In this age of shiny web applications and mobile computing, emails have sustained their supremacy over all the other marketing channels. It is the communication tool that has worked seamlessly for all your prospects. Email marketing is a dynamic, paradigm-shifting field with a rich scope of innovation. Through 2017 and 2018, it has fostered diverse trends like typography, gamification, dynamic content, CSS-based animations to name a few. Let’s have a sneak peek into what kind of designs lie ahead in the sovereign state of email marketing. APNG is an extension of the Portable Network Graphics (PNG) format that adds support for animated images. Stuart Parmenter and Vladimir Vukićević from Mozilla Corporation created this specification in 2004. Sadly, it was rejected by the PNG group in 2007. Nonetheless, in 2016, Apple singled out APNG as the preferred format for animated stickers in iOS 10 iMessage apps. It can be directly compared to GIFs because both are lossless formats supporting animated images. APNG images support 24-bit colors and 8-bit alpha transparency. APNG file size is a bit greater but better in quality. GIFs support 8 bits per pixel for each image without any transparency. GIFs are comparatively lighter in weight but quality of the image is compromised. The object on the left is in APNG format, while the right one is a GIF. The difference in the quality is quite clearly visible in both the images. Here is an example of APNG in email. The cute red arrow at the bottom is an APNG animation that reflects clarity and high resolution. An email with APNG is much lighter in size, as compared to that with a GIF. It is supported by all email clients except Outlook, Gmail App & Gmail Desktop. Fallback will be the first frame of the GIF animation. 2019 is expected to be the year of amalgamating technology with design. With the advent of intelligent email designs, your subscribers can now take action right within the inbox. A good example is of embedded surveys in emails. It is a convenient way of taking surveys in the email, without being redirected to a landing page. 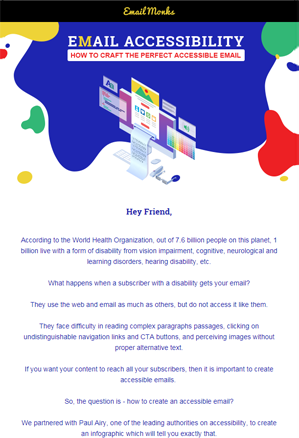 Accessibility has eliminated the barriers for your email recipients and made it easy for everyone in your potential target group to access the emails. It helps to create more readable, usable, and logical content. Also, the design is comprehendible for everyone, including specially able individuals. EmailMonks built an accessible email to reach out to all the subscribers irrespective of any health inhibitions. Interactivity and kinetic designs beyond hover and click will be the trend in 2019. It will mark the continuance of mailable microsites, helping create more informative emails. Designers will put on their thinking hats and create smarter gamification emails to engage the subscribers. Implementation of gamification has helped reinvent new realms in the world of email design. Imagine playing a game in the email inbox and getting rewarded in the form of incentives or discounts. Doesn’t that sound awesome? EmailMonks designed the first ever maze email and got the subscribers awestruck with the cool interactivity. Sending personalized emails is not just a best practice, it is a trend that is HERE TO STAY. It has become possible to fetch dynamic data in emails based on subscriber preferences and that has picked up pace in the recent times. The arrival of such functionality has made emails more valuable for the users. The usual layout of emails includes a header image, concise email copy with a relevant visual, and a clear CTA followed by the email footer. How about trying an asymmetrical layout with broken grids? This trend is extensively used in website designs and it can be used in emails as well. Given below is an example of 960 grid system. The problem with grids is that it makes the designs look familiar & monotonous and eliminates the room for innovation. Broken grids were introduced to do away with predictable and restrictive designs. It allows the email marketers to position the design elements in such a way that it does not follow a linear layout and experiment with ‘cut-out’ imagery. You can defamiliarize your subscriber and design your own icons to break the monotony in your emails. It is a good idea to add a surprise element in your emails so that your subscribers have something different to look forward to. Position the CTA at an unconventional place to decondition subscriber behavior and impart freshness to the otherwise bland emails. Use negative space and design more of full-width emails that improve the user experience and enable effective usage of the available space. Check out the email by Levi’s that goes out of the way to create a broken grid layout with beautiful imagery. In the beginning of 2018, Gmail announced the addition of native support for dynamic and interactive emails powered by AMP (Accelerated Mobile Pages). An AMP-powered email will let you stay in the email instead of driving you to a web browser. It will revolutionize the way users interact with an email. AMP looks like a promising trend because you can update the information in real-time. As a result, your email will always stay fresh with accurate content whenever it is opened. A separate MIME-type text-x-amphtml will be required for the AMP version of the email to work in Gmail. It will, of course, be additional work for brands but we believe it will be picked up well by the subscribers and the inbox providers. Booking.com does great work at sending out an email that perfectly follows the principles of AMP. 3D memes have entered Facebook heralding the era of 3D images in emails. It will take static images in emails to the next level in the days to come. help you reinvent new perspectives in storytelling and design emails that convert. Trello does a great job at sending gradient-based email with a white card that stands out and conveys the message. Custom illustrations will set foot in email designs and create a better visual impact in the subscribers’ minds. Salesforce does a great job at sending custom illustrations in their emails. These illustrations make a difference to the entire look and feel of the email. Monochrome emails and gradient-based design will take off beyond the long- established email designs. Have a look at this monochrome, minimalistic email by Tradesy. It makes a clever use of ‘black and white’ theme to welcome the subscriber and offer a coupon code to prompt the first purchase from them. Live Twitter and Instagram feeds will make their way into emails, facilitating better integration of social media marketing and email marketing. This would mean that when the subscriber opens the email, it will fetch the latest tweet in the email at that time. Marketers can also experiment with Live Pinterest feed if their brand relies on this channel. These live social media feeds will help to garner more organic visitors on your website and enhance your brand visibility as well. Innovative fonts and typography add a wow factor to the email and captures the subscriber’s attention. E-commerce and retail brands have used typography to highlight important offers and it has proved to be an effective trick to tempt customers to purchase. Aeropostale incorporates typography in their emails to highlight all the important stuff for the reader. Including video in emails helps to increase the open rate by 19% and click-through rate by 50%. It will be a promising trend for event marketers and service-based business owners. The main advantage of videos is that it enables more effective communication of the message. Rentalcars.com excels at using video in email marketing. Check their email design below. Except Gmail, Yahoo!, and Outlook, all email clients support video in emails. Emails cannot evolve without the evolution of email clients. Often, email developers cannot use a particular feature in their emails because email clients do not support it. Fixed CTA does not work in Apple devices. If email clients adapt to the changing trends and be more 'developer-friendly', it would give the email developers more scope to explore the possibilities and create even better emails. Which design trends will be the rage among email developers during 2019?